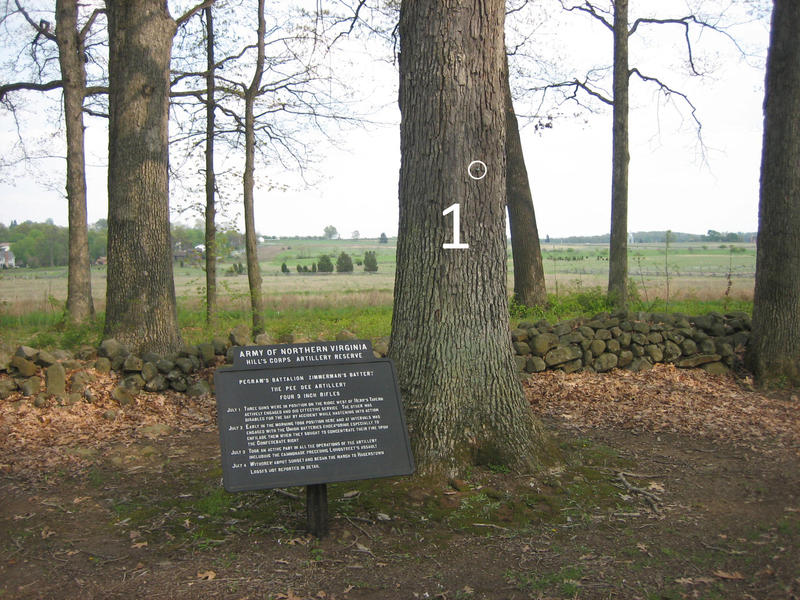 Along West Confederate Avenue, most people focus on the fact that the left side of the Pettigrew-Trimble-Pickett Assault/Longstreet’s Assault/Pickett’s Charge was launched from here. 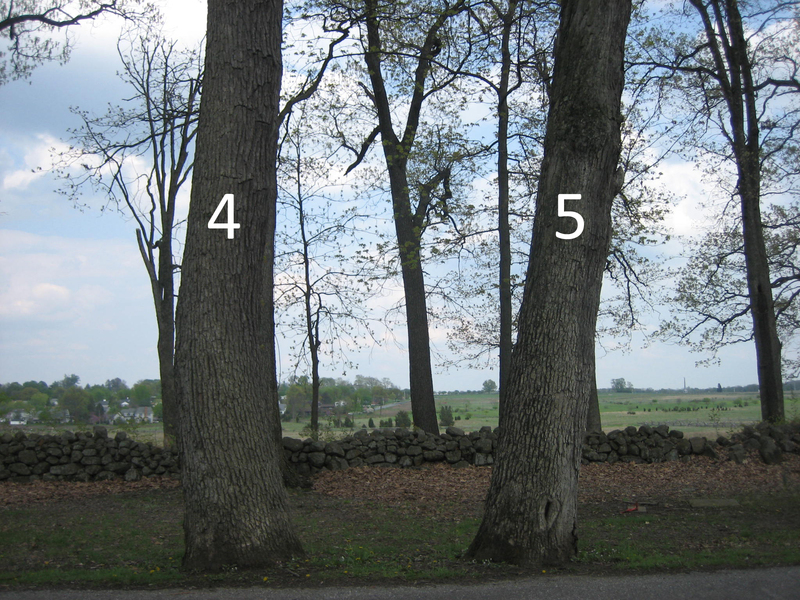 This photograph shows five witness trees. All except tree #4 contain tags. This view was taken from the northwest facing southeast at approximately 4:30 PM on Wednesday, April 30, 2008. 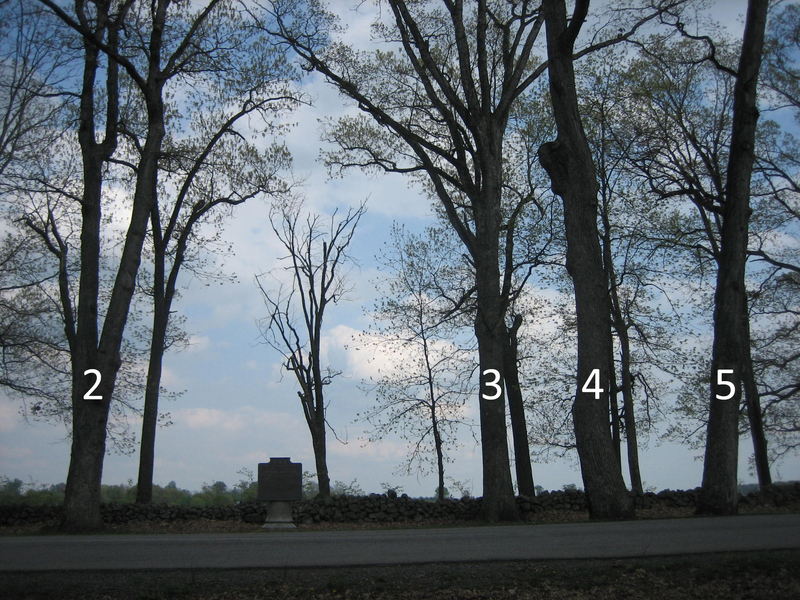 Visitors frequently ask about trees that might have been on the Gettysburg Battlefield in July, 1863 and are still standing today. The most common guess is that there might be somewhere between 100 and 200. 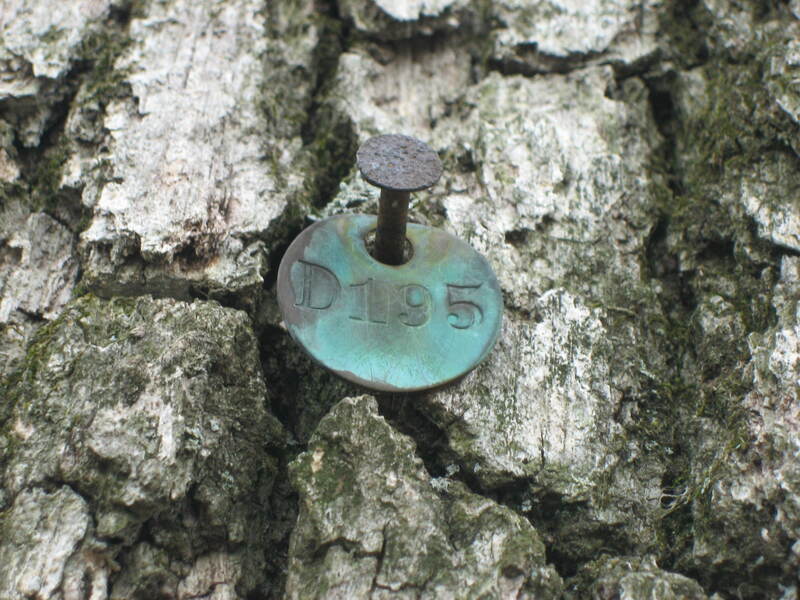 The United States War Department, which operated Gettysburg National Military Park before the National Park Service took over in 1933, thought some of these “witness trees” were important enough to mark and sometimes, protect. 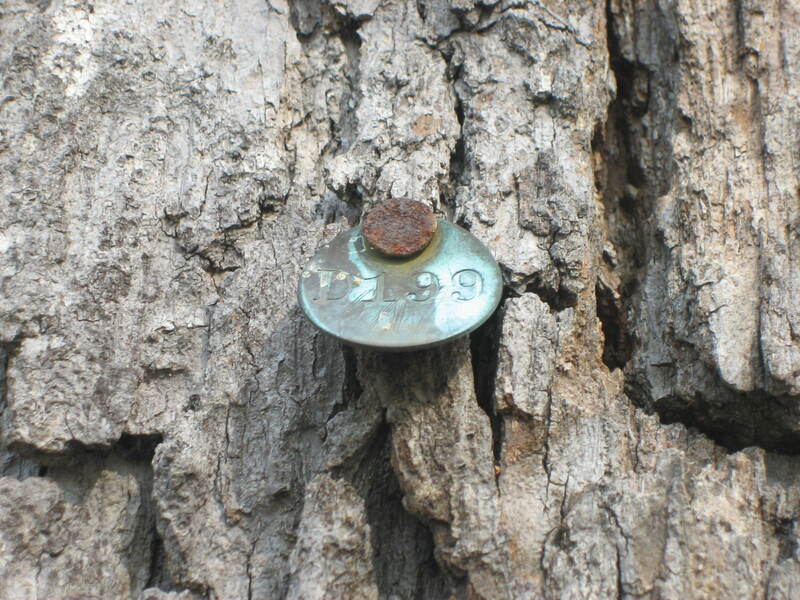 Small brass tags were placed in some of the trees, and lightening rods were also placed in some. 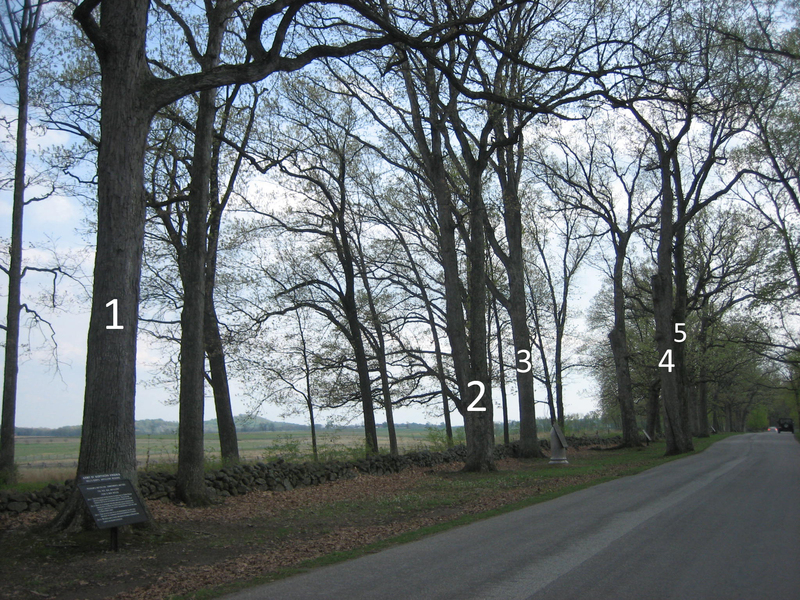 The Gettysburg Daily took pictures of some of these trees on Wednesday. 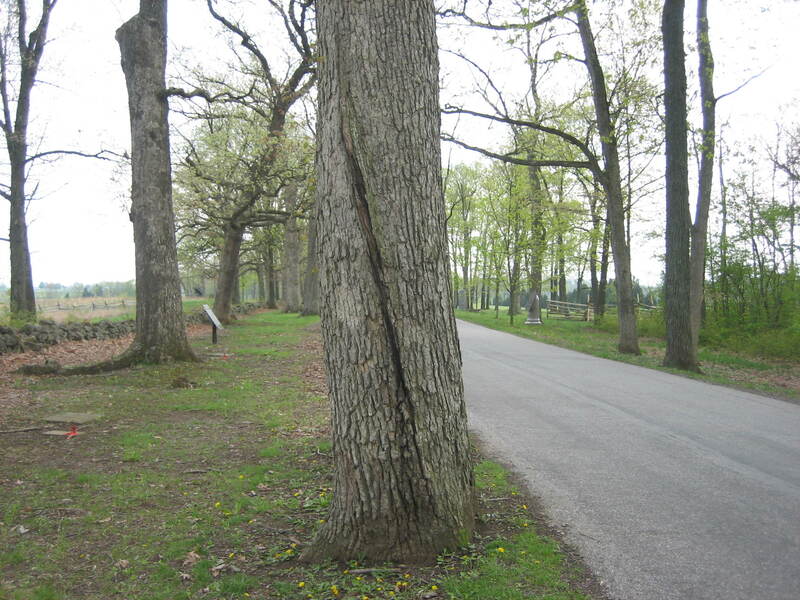 See other posts on Gettysburg Witness Trees for May 27, 2008, August 10, 2008, August 12, 2008, August 16, 2008, August 27, 2008, and September 8, 2008. The previous shot was taken just south of the sign for McMillan’s Woods which is on the west side of West Confederate Avenue. This view was taken from the east facing west at approximately 4:30 PM on Wednesday, April 30, 2008. Tree #1 is just south of the marker for the Pee Dee Artillery. The Pickett Charge fields and Cemetery Ridge are in the background. The tag on the tree has been circled. This view was taken from the west facing east at approximately 4:30 PM on Wednesday, April 30, 2008. Tag D 199 on Tree # 1. This view was taken from the west facing east at approximately 4:30 PM on Wednesday, April 30, 2008. 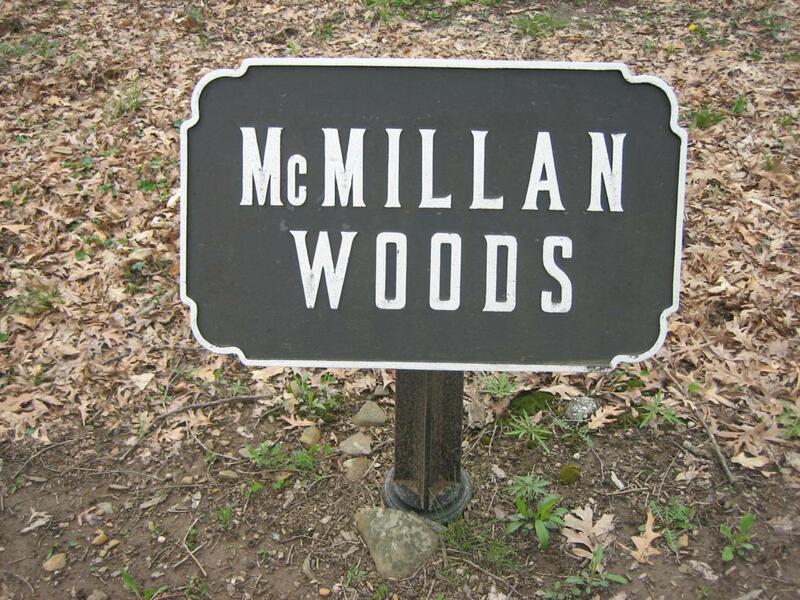 Trees 2 through 5 are also on the east side of West Confederate Avenue near the marker for Pegram’s Battalion. This view was taken from the west facing east at approximately 4:30 PM on Wednesday, April 30, 2008. 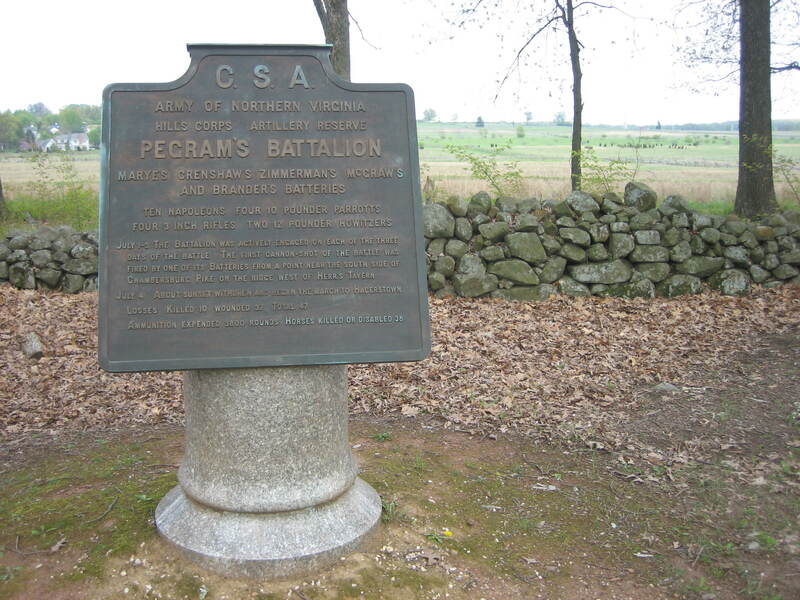 A closer view of the Pegram’s Battalion marker. This view was taken from the west facing east at approximately 4:30 PM on Wednesday, April 30, 2008. 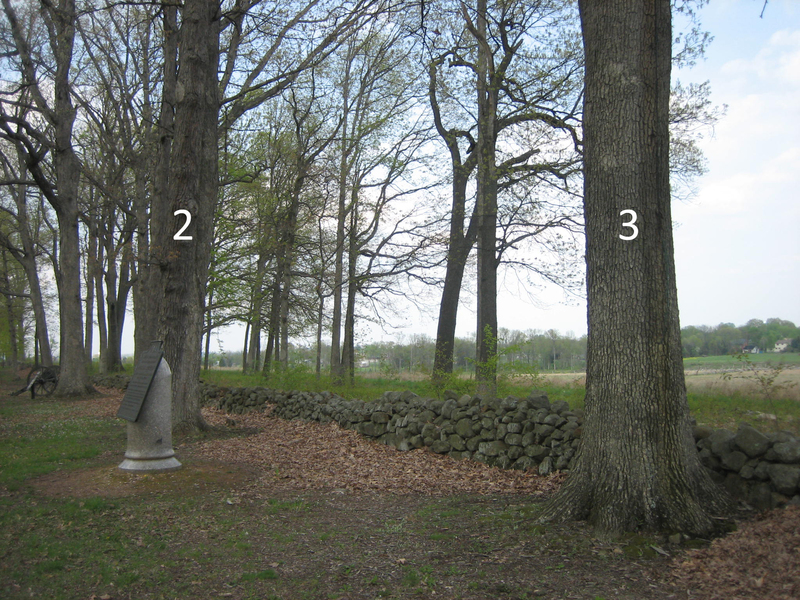 Trees 2 and 3 are on either side of the Pegram Battlalion marker. 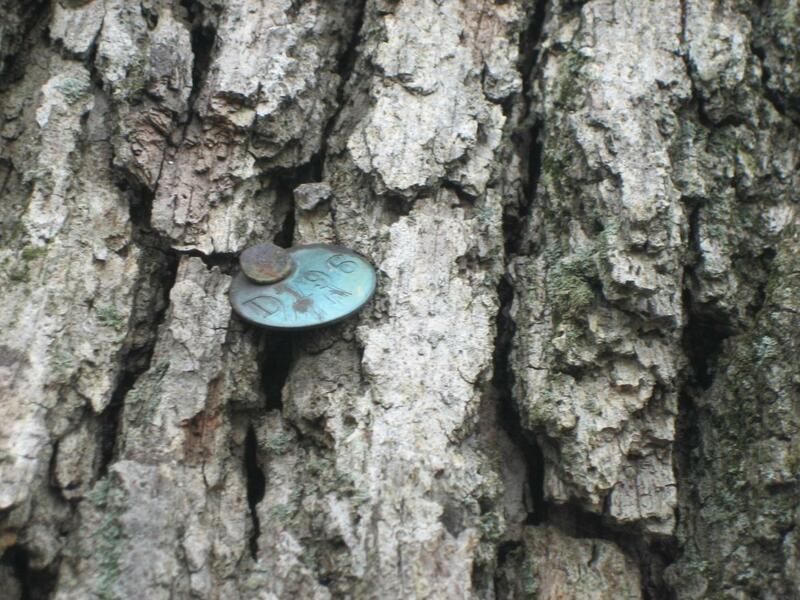 The tag on tree # 2 has been circled. This view was taken from the northwest facing southeast at approximately 4:30 PM on Wednesday, April 30, 2008. Tree #2 contains tag D 196. Gettysburg National Military Park Historian Kathy Georg informed Gettysburg Licensed Battlefield Guide Deb Novotny that this is the Pender Tree. 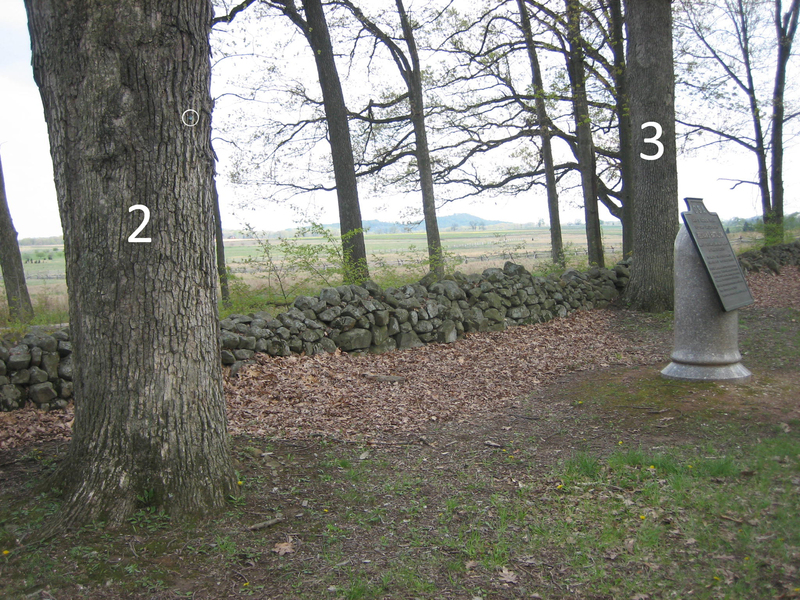 She stated it was the first tree north of the Pegram Battalion marker, on the west side of the stone wall. This view was taken from the southwest facing northeast at approximately 4:30 PM on Wednesday, April 30, 2008. Trees 2 and 3 from the southwest. This view was taken from the southwest facing northeast at approximately 4:30 PM on Wednesday, April 30, 2008. 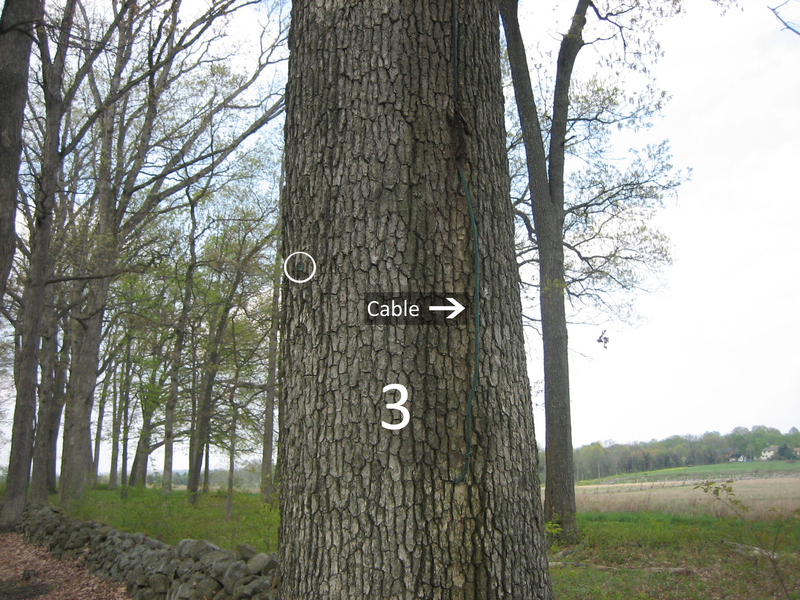 A closer view of Tree # 3 (this has also been designated by some as the Pender tree, where Confederate Brigadier-General William Dorsey Pender was mortally wounded on July 2, 1863) shows the remains of the cable used to ground the lightening rod. The tag has also been circled. This view was taken from the southwest facing northeast at approximately 4:30 PM on Wednesday, April 30, 2008. Tree # 3’s tag is D 195. This view was taken from the southwest facing northeast at approximately 4:30 PM on Wednesday, April 30, 2008. Trees 4 and 5. This view was taken from the west facing east at approximately 4:30 PM on Wednesday, April 30, 2008. Tree #4 does not have a tag, but here is the scar from the lightening rod cable on the north side of the tree. Tree #5 does have a tag, D 193, but your editor did a poor job focusing on the tag, and we are not including that picture. This view was taken from the southwest facing northeast at approximately 4:30 PM on Wednesday, April 30, 2008.